In the Marina District of San Francisco, expanding an exisitng condominum is a challenge. But rather than leave such a desirable location, many people would rather find a way to make do. The design firm William Duff Architects (WDA) figured out a way for his client to get both a fitting expansion and a way to make do with the condo they loved. This “perfect solution” story involved one big move – adding a master-suite penthouse to the existing third-story condominium – but also smartly integrating the existing roof as additional living area. As result, WDA created a far more sustainable design. And intrinsic to this green solution was the use of NanaWall. 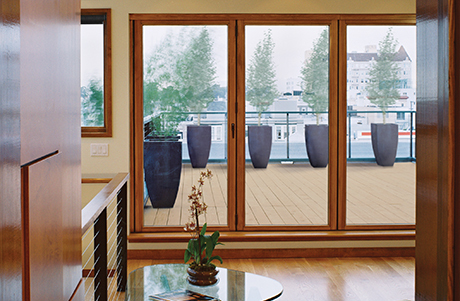 WDA has used NanaWall products extensively in their high-end projects throughout the Bay Area. 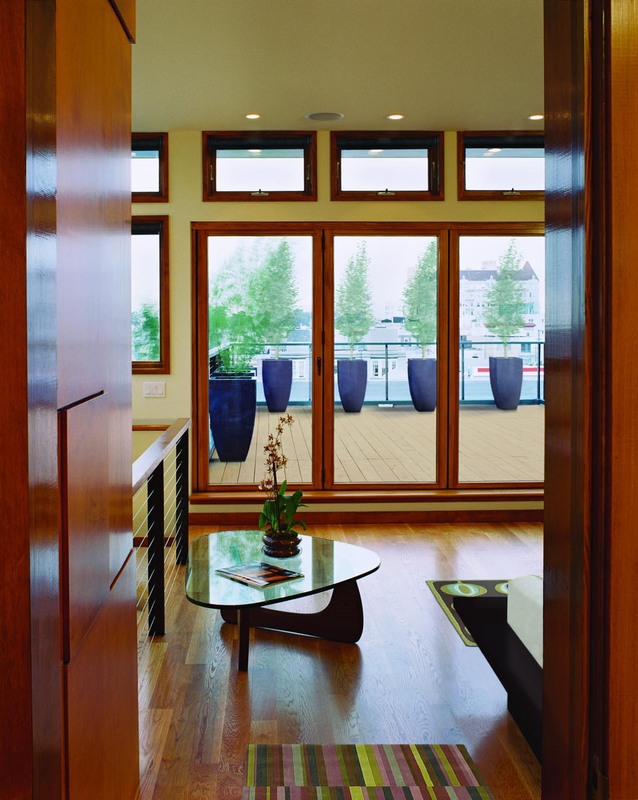 Because of NanaWall’s wide selection of styles and finishes, Duff was able to match the trim on the WD66 system to the teak stains found throughout the penthouse. He was also impressed with NanaWall’s professionalism and liked that they are a local company with a global presence. “Their staff is knowledgeable and easy to collaborate with, and a good portion of their products are produced locally,” Duff comments. “In addition to bringing the outdoors in, NanaWall allows in copious amounts of sunlight, which is an inherent energy-saving factor." 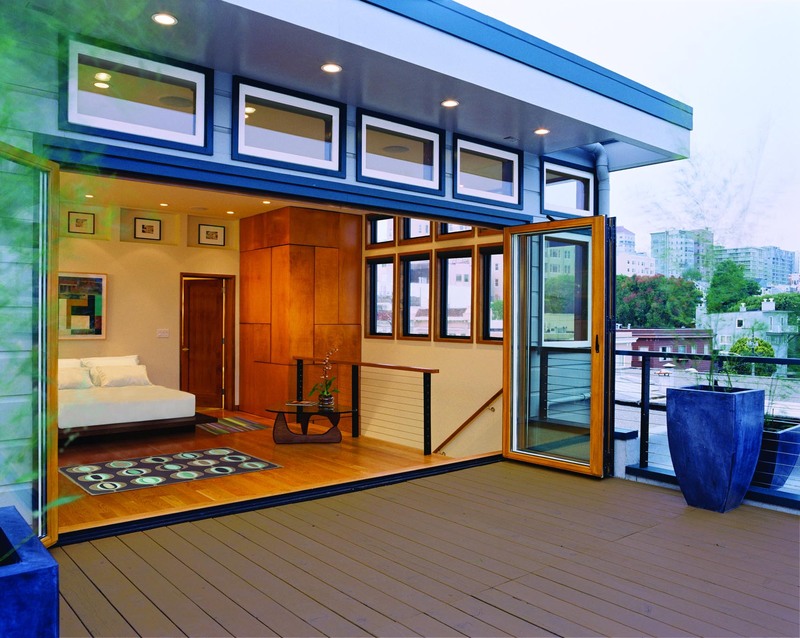 WDA’s marina penthouse utilizes the four WD66 panels, a standard folding or paired-panel, wood-framed system designed to provide an opening up to 39 feet. “NanaWall’s clean lines matched our client’s modern aesthetic,” Duff contends. 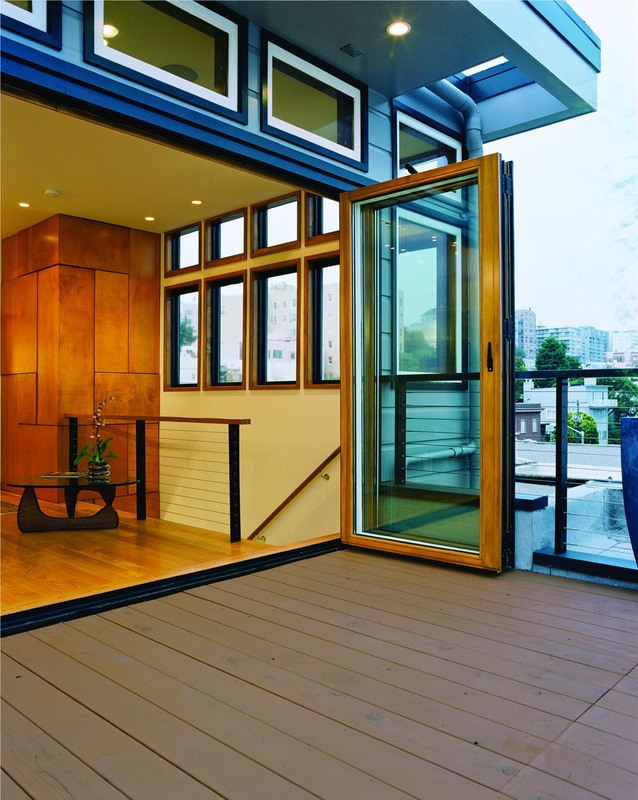 In addition, the homeowner can open their system to usher in natural ventilation and the sounds of the city. Taking a step up from their walnut stained floorboards onto their deck, the owners look out to a cubist collage of rooftops, harbor views, the Golden Gate Bridge and the lush Presidio. Duff connected the indoor and outdoor spaces in other ways, too. The deck floorboards run in the same direction as the wood floors. The steel tensioned balustrade over the stairs is echoed on the deck perimeter. The colors of the planters are repeated in the throw rugs, and even the ridges of the planters align with horizontal lines of the siding and balustrades. Indeed, Duff designed a bright, daylight-soaked interior. On all three sides of the master bedroom, he added transoms. The design is unified with similar shapes carved into overhead niches above the bed. 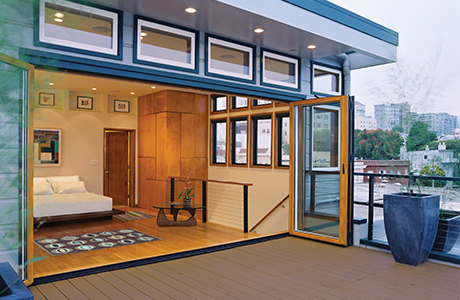 Cleverly, the flat roof cantilevers almost 5 feet out to keep solar glare out of the room. 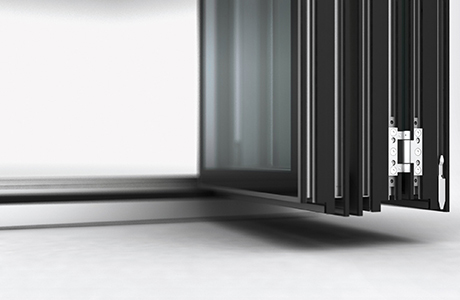 The WD66 system also contains a swing door option: Access to the roof can be realized without unfolding all four panels. 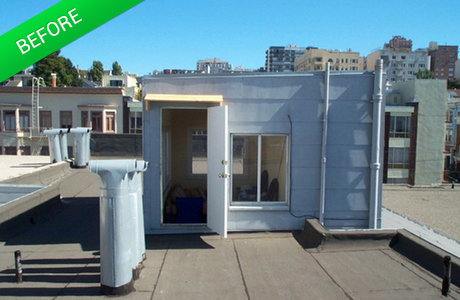 The locking hardware is contained inside, which provides needed security because the roof patio can be accessed from the third floor.